These delicious muffins feature Maranatha® Peanut Butter and Sunspire® Chocolate Chips. 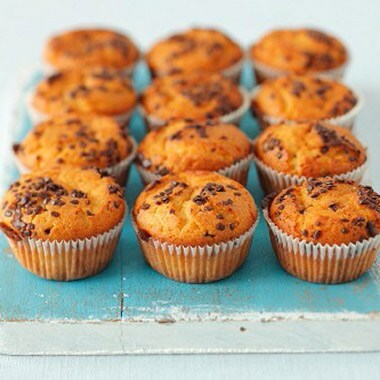 They bake up moist and light and make for a perfect complement to your breakfast or as an afternoon treat. Preheat oven to 350° F. In a large mixing bowl, combine peanut butter and melted butter; stir until well blended. Mix in brown sugar, eggs, and vanilla. Combine flour with baking powder and baking soda. Add to peanut butter mixture along with milk and chocolate chips. Stir just until combined. Spoon batter into 12 paper-lined 2 1/2- to 3-inch muffin tins. Bake 20 to 25 mins, or until muffins spring back when lightly touched in center. Serve warm or at room temperature.